Snickers Peanut Butter Cookies take an already incredible soft and delicious peanut butter cookie recipe, and add a Snickers surprise in the middle! Snickers Peanut Butter Cookies are a favorite at our house, and it’s easy to see why! 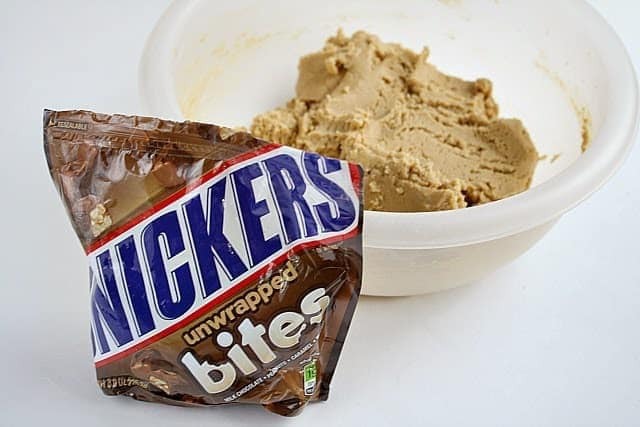 The cookie itself is soft with the perfect hint of peanut butter flavor, and when you bite into it, you get to enjoy a mini snickers hidden inside! Especially when these cookies are warm (I always microwave them for about 10 seconds if I’m eating them later), the soft and gooey combination is to die for. You might want to make an extra batch! 30 mini-sized Snickers bars I've used the miniature size before, but the last few times I've made them I used the "unwrapped Snickers bites" and they are even better because you don't have to unwrap each of them! C and H are my middle children. They are the closest in age of my five and are best friends. H is so sweet in going along with C’s shenanigans.